The Friends of the Sheridan Library will host a reception for artist Ken Carlson of Twin Bridges on Thursday, March 22, 4:30pm at the Sheridan Library, where his Montana landscapes in oil are on exhibit through the month of March. The Friends of the Sheridan Library will present a panel discussion, “Growing Up in the Ruby Valley,” on Sunday, March 18, 5 p.m. at the Sheridan Library. There is a lot to be said for growing up in and around small Montana towns. Life was simpler in some ways, harder in others, but you always knew where you were. ENNIS -- During its meeting on March 8, Ennis council tabled action on adopting county subdivision regulations until a special meeting on March 13. Council plans to adopt the county subdivision regulations until new town regulations have been reviewed and approved. VIRGINIA CITY -- The Madison County Commission appointed five members to a rejuvenated housing advisory board during its March 6 meeting. The commission voted to reestablish the disbanded board and advertise for candidates earlier this year. Bowhunter Education classes will be conducted April 2, 3, 4, 5 and 7 at Twin Bridges High School in the Montana Room. The classes are for both adults and youths who will be at least 11 years old by the first day of class. Students must attend all five sessions to be certified. 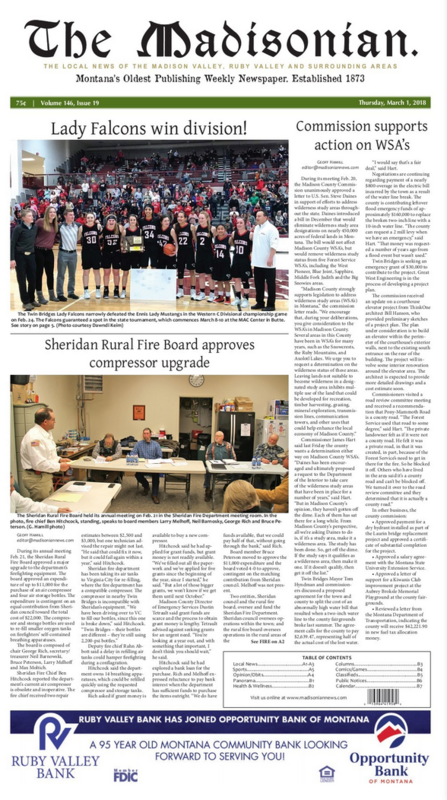 Two Madison County teams took to the state basketball court last weekend in Butte. The Twin Bridges Lady Falcons found themselves with a fourth-place finish after the three-day, four game venture. The Ennis Mustangs nearly made it to the consolation game on Sat., March 10, but ultimately lost out to Froid-Medicine Lake. Madison County Commissioners tabled an official development plan submitted by Moonlight Basin, per a request from Moonlight’s representatives Kevin Germain and Christina Calabrese. Raymond T. Shanafelt appeared at the Madison County Courthouse on March 12 for an initial appearance. Shanafelt is being charged with one count false claim to public agency after an incident in Madison County in March 2014. Shanafelt appeared without council and his case was postponed.